A 1 hour hands-on activity for upper primary age. How do you make the slimiest slime and the foamiest foam. What makes a liquid cuttable and a ball bounce? 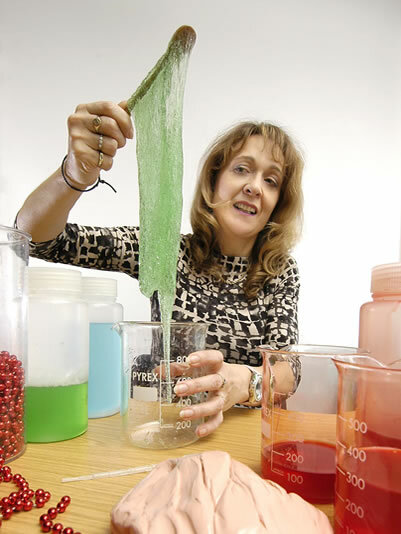 This hands-on workshop covers a wide range of material properties with lots of new ideas and experiences. It is suitable for years 5 & 6 and can accommodate a full class as long as 2 additional adults helpers are on hand to supervise the experiments. The event is free to schools within 1 hour’s drive of Reading. The event lasts up to 1 hour depending on how many activities you want to include. All students can take home a bouncy ball, a piece of foam rubber and a bag of slime they have made themselves.